For Immediate Release: Posted On 5/30/2012 By Industrial Magnetics, Inc.
Industrial Magnetics, Inc. patented family of Transporter® LP, magnetic end-of-arm tooling for the Appliance, Automotive, Office Furniture and material handling industries is now available with a BSPP fitting (British Standard Pipe Parallel thread) on 3" diameter models. IMI Transporters® magnetically transfer metal blanks, stampings & parts in automated station-to- station, press-to-press transfer and robotic pick-and- place applications. 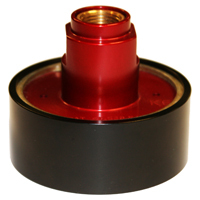 Engineered with powerful, Rare Earth magnets that positively hold the part during transfer - even during unexpected loss of shop air - the Transporter® greatly reduces chances for slipping and shifting of parts due to mill oil coatings, dust, dirt, rust or weld splatter and provides more options for pick-up points on stamped, perforated and odd- shaped parts. Transporter® LP magnets are designed to directly replace vacuum cups with only minor tooling adjustments and can be easily installed to existing air connections on tooling booms or robotic face plates. Requiring only a short, single burst of shop air to quickly release parts, the low-profile Transporter® LP offers a significant reduction over vacuum and suction cups in shop air costs. The 3/8 BSPP fitting is available on 7 different products in the 3" diameter Transporter® LP line, including the Standard, Extra Strong, Destacker, Non- Stacking & Double-Acting models and can be purchased from the company’s website at www.magnetics.com, or by speaking with a product specialist at 888.582.0823.